When you put an inflatable stand up paddle board to test, you will discover that the best of these are stable, easy to transport and inflate, and glide easily on water. Below you will find detailed information about the top ten iSUP boards. 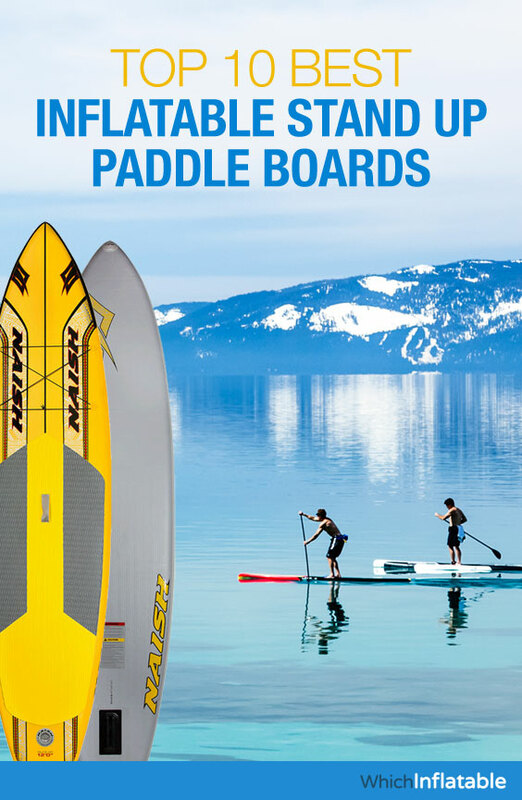 They are high-quality and durable boards which add fun to your paddling. 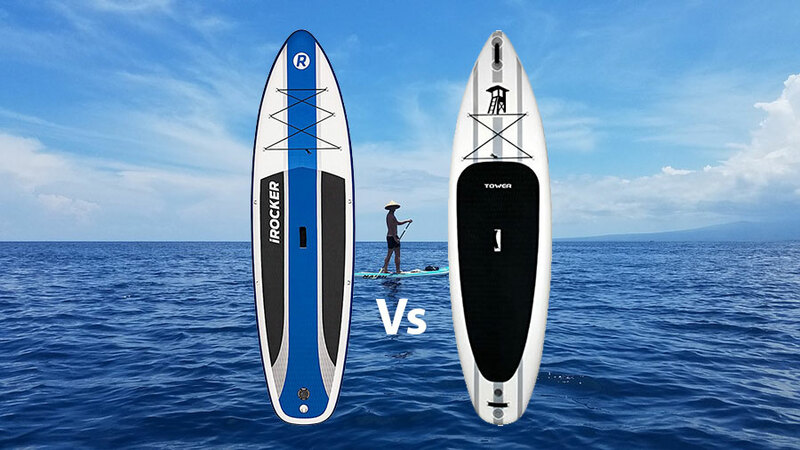 Which is the Best Inflatable SUP Board? This paddle board is sturdy and supports weights as heavy as 350 pounds. It feels firm when fully inflated. It is similarly durable because of its strong materials and quality stitching that prevents cracks. This paddle board is also easy to transport and store. 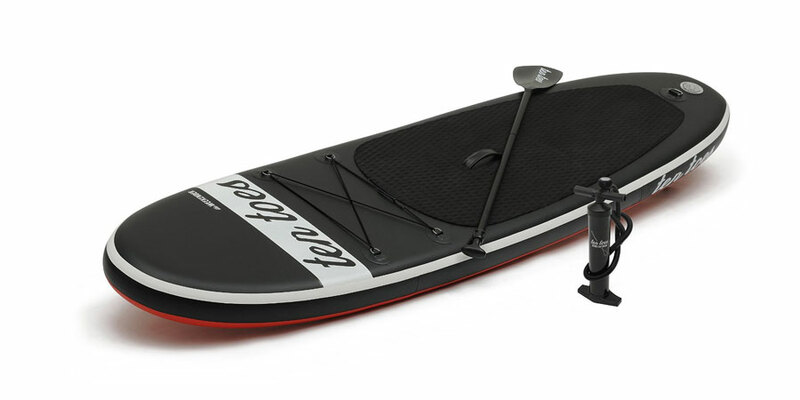 It includes a pump, board and adjustable paddle to make your water adventure convenient. 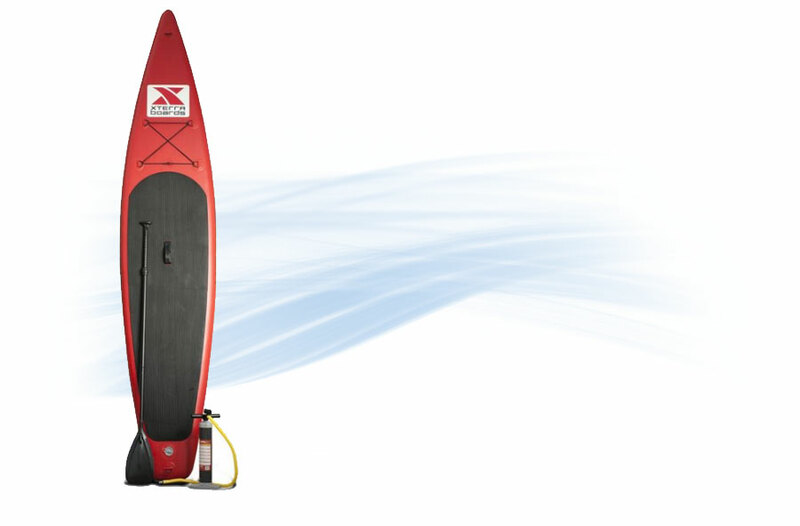 This SUP board further has a two-year warranty which includes everything beyond the normal wear and tear. In addition, its performance is admirable and matches that of a hard board. It is comfortable for adults and very stable during a ride. This makes it suitable for beginners. 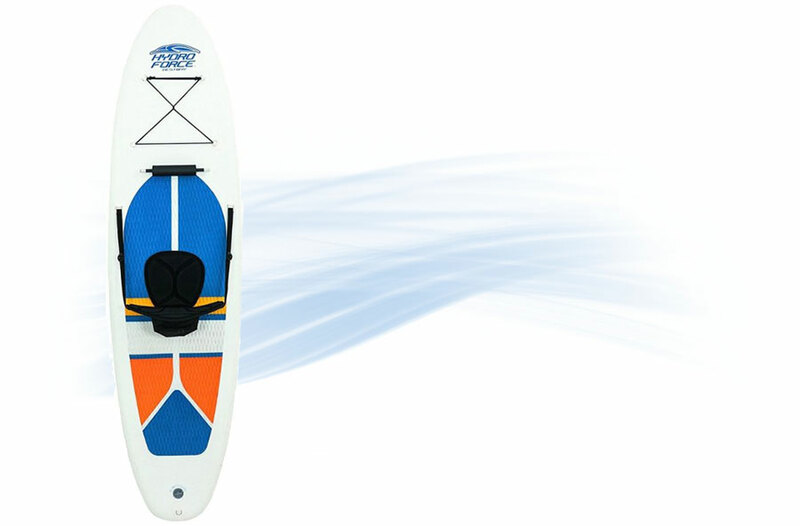 This paddle board is very stable and makes it ideal for anyone at any skill level. It is made from strong PVC material that makes it indestructible. Its dimensions are also right, and it is firm. Furthermore, it can be rolled up for easy storage and transportation. 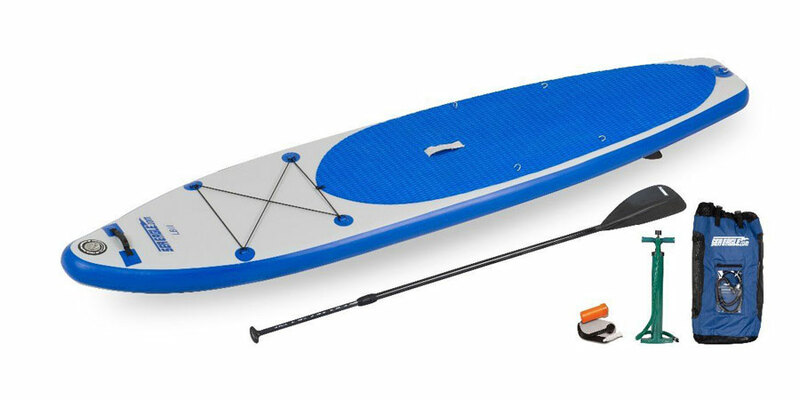 This paddle board comes with a manual pump, aluminium paddles and repair kit. It even has a 10-year warranty. It is a favourite because it is versatile and makes it easy to manoeuvre. It is also less intimidating to beginners and enhances a relaxed surfing session. You can carry it around easily with its handle. However, it can only support up to 250 pounds. 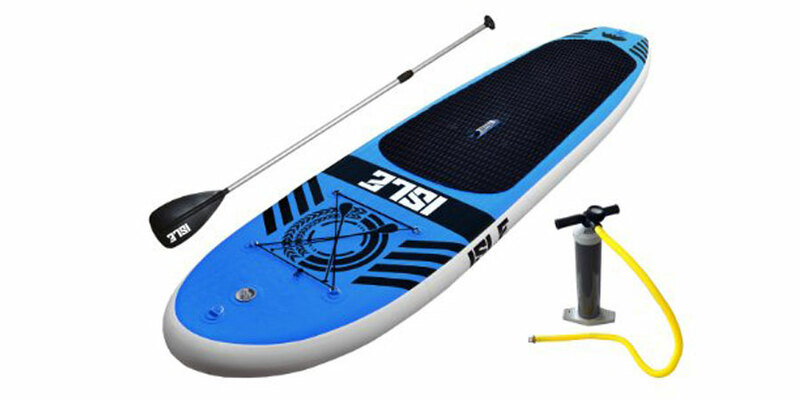 You will love this SUP board because of its convenient high pressure pump and adjustable paddle. It is a superior board when fully inflated and becomes very stiff. It is thick and makes it comfortable for adults to ride. Its durability will amaze you, and this stems from its strong PVC material and great stitching. It saves you from worrying about dings and cracks. Just like other boards, this one is easy to carry and store while deflated since it rolls up conveniently. You can also enjoy its two-year warranty for engineering and material defects. Still, this SUP board can only support 350 pounds on water. This paddle board is versatile and works as a SUP, canoe and kayak. It is suitable for yoga and fishing too. It is easy to store since it rolls up into the size of a sleeping bag. It weighs about 24 pounds and is great for rivers, flat water and small waves. It can be used by beginners who weigh up to 200 pounds. Furthermore, it is a durable board that survives any tough situation. It material is almost impossible to destroy. Moreover, it comes with a pump, fins, travel paddle and repair kit. Its paddle is adjustable and is made from aluminium. 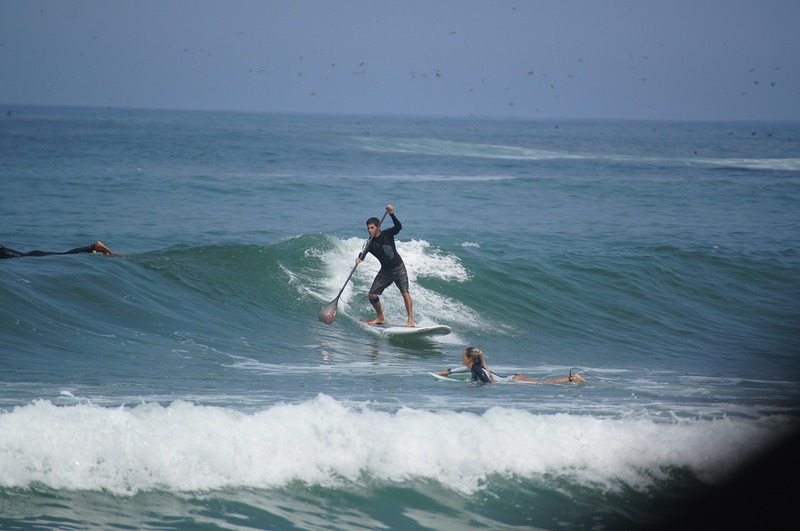 Once you try this SUP board, you will love and stick to it. It is well-designed for all-round boarding. It is also versatile and suits many water conditions and different riders. 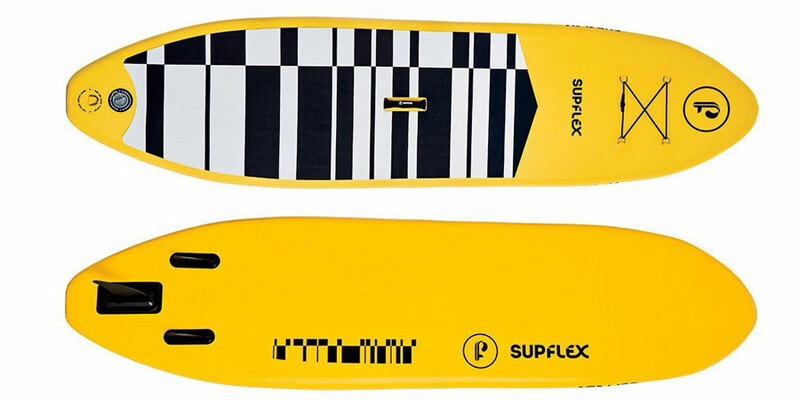 The other good thing is that it is unique and among the best inflatable SUP boards. 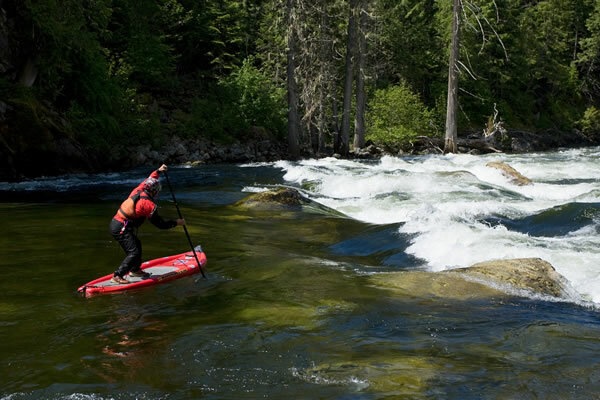 You can even add an inflatable seat to this SUP board in order to operate it like a kayak if you want to. In addition, it is fun, stable and easy to manoeuvre. It has a thick board and is lightweight. 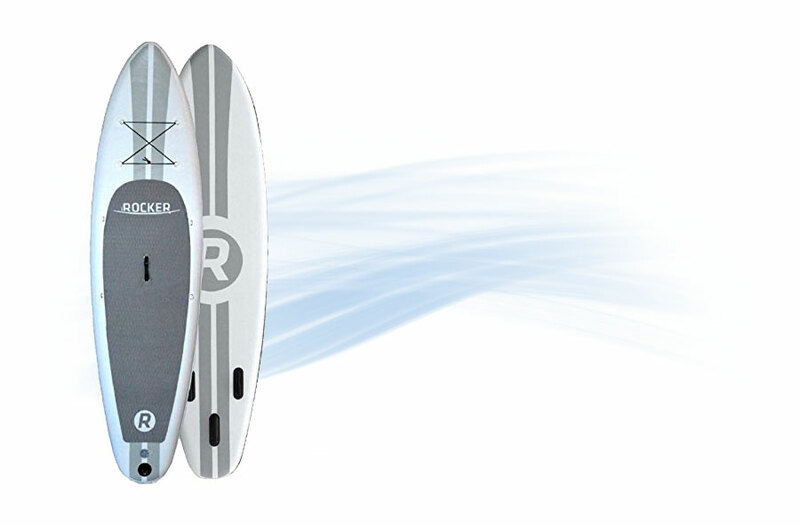 Its dimensions further enhance the surfing experience. It is a high quality board which is made from tough material that makes it ideal for most individuals. It also has a three-year warranty and 180 day risk free trial. Still, this board can only support up to 175 pounds which means only one person. 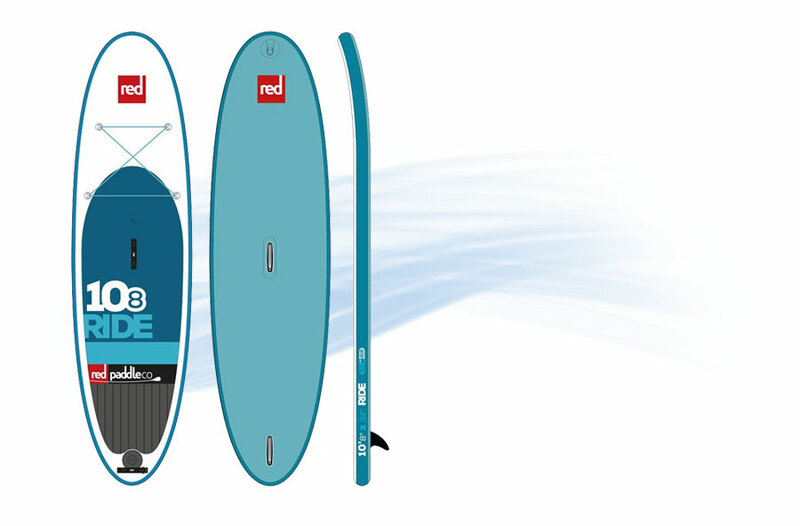 This is a phenomenal board that is well made and makes paddling fun. It is a favourite and is versatile to suit different individuals. It is also a tough board. It performs well in water, glides easily, tracks straight and is suitable on lakes, rivers and ocean bays. Still, it is not as fast for professional users. This board has small fins to keep it focused and has secure rings. Its deck is further comfortable. 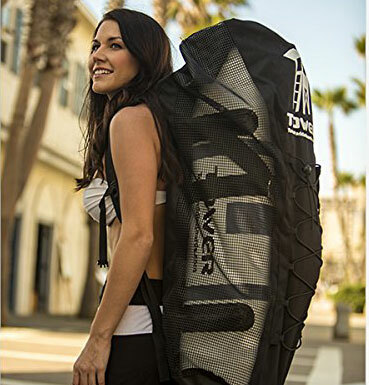 You will love this board for its rolling backpack that makes it easy to carry as well as store. It comes with a manual pump which takes some time to inflate but makes work easy. 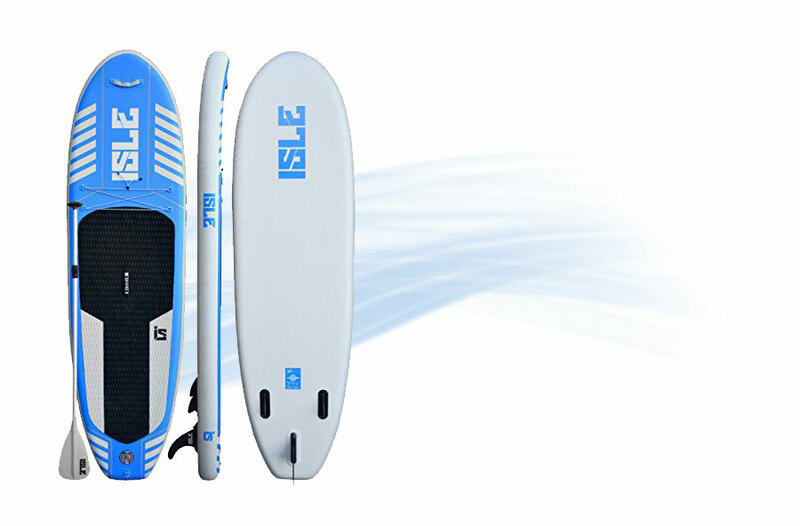 This paddle board comes with a convenient backpack and three-piece aluminium board. It is a thick and wide board. 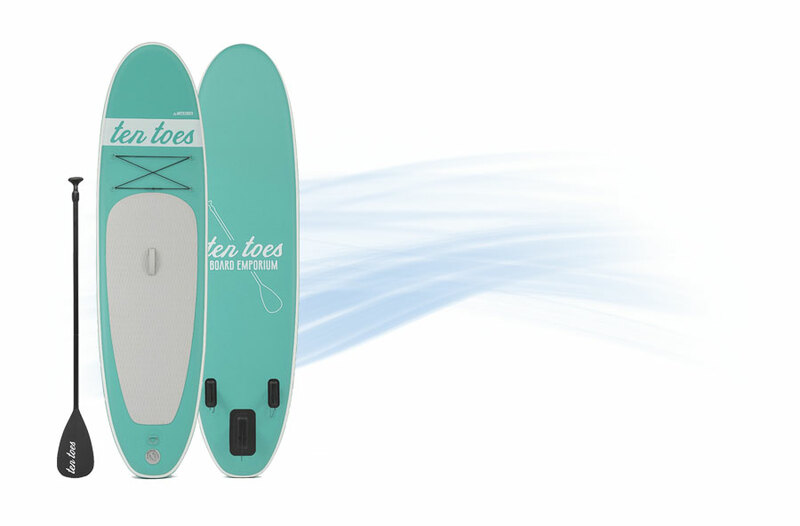 Its dimensions make it stable and enable easy cruising in water. It makes you ride high and stay balanced. In addition, it is made durable because of its rigid stitching and amazing reinforcement. It is reinforced with military-grade material. It further comes with a high pressure pump and has a comfortable grip. It was designed with convenience and functionality in mind. However, this board weighs 31 pounds and can only support a mass of 275 pounds. 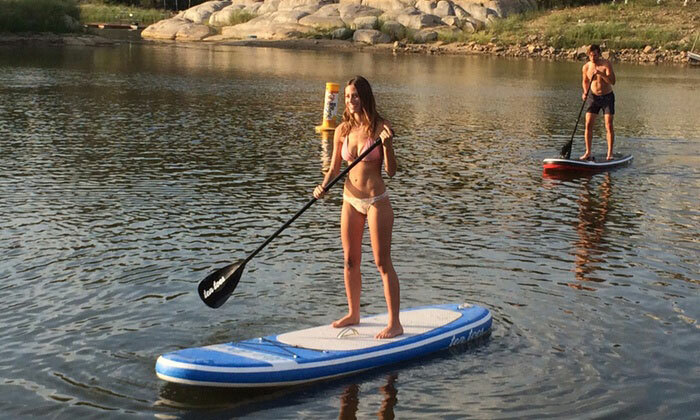 This paddle board has the right dimensions and is also lightweight. It is easily inflatable and has a strong stitching. It is ideal for advanced riders who want to try all the aspects of the sport and may not so great for beginners. It has durable stainless steel rings for safety leashing or attaching a seat. It even comes with a backpack to make storage and transport convenient. It further has a high pressure pump, adjustable paddle and repair kit. The elegant design of this monster will make you love it. This paddle board is very strong and rigid. It also has four stainless steel downs to secure gear. 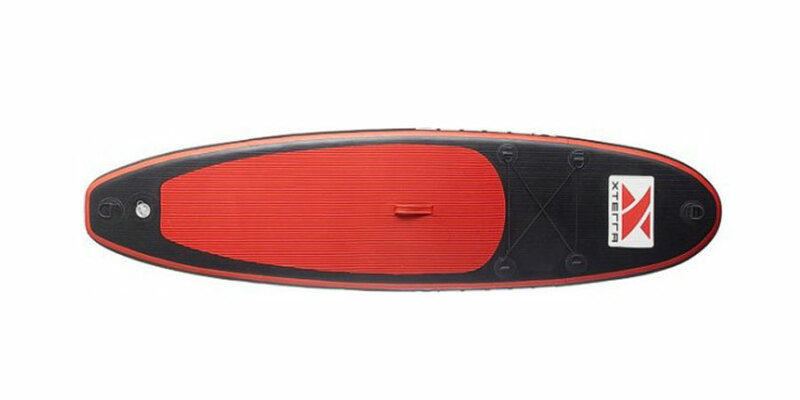 It is a sleek, lightweight and fast SUP board. It comes with a high-pressure pump and is made from durable PVC material. It further has a carry bag and gauge. This board has a great discount on Amazon.com, and you will love its ease of use and hard board. It is comfortable to stand on and suits different individuals. Furthermore, it does not buckle in the middle and remains firm. It can however be a challenge to inflate to the required pressure. This is a specialty board which is fast. Its design is magnificent and makes this board ideal for touring. It is thick enough to provide stability even to adults and larger riders. It can also support a lot of weight without any buckle or flex. This does not mean that it will not work well for small people. 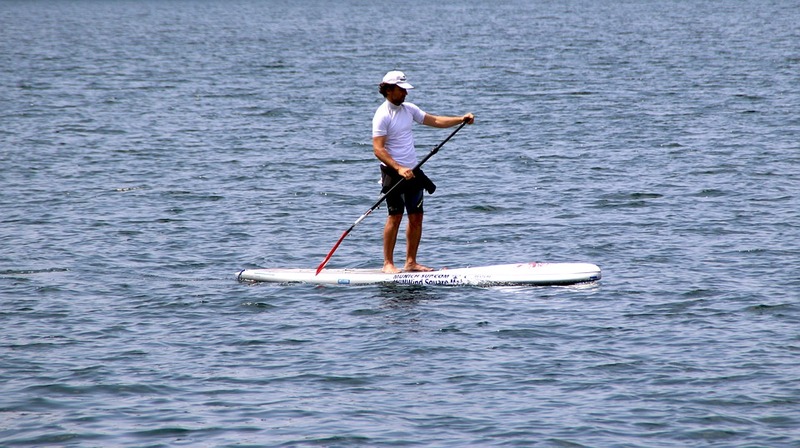 It is a fun paddle board, and feels safe and secure while riding. Its quality is further top-notch and exterior looks cool. It suits both flat water and ocean bays. This paddle board is very portable because it is light in weight. It also has a good buoyancy in water because it has a high pressure. It has a removable Triffincenter which makes it very convenient. The purchase of the paddle board comes with a set of a board, pump pressure gauge, a three piece break down adjustable paddle, Tri fins and a carry bag which has backpackstraps. Made with the highest quality materials which make them thick and very durable. It is also very stiff so as to give you good service. It is a very high quality board that is durable and will last for a lifetime. It is also a universal board that can be tied to any point on the board. It offers maximum protection allowing your kid to ride at their comfort by providing a strong grip. It is very easy to learn to use it and inflating it is very simple. It is very durable and resilient to give a lifetime service and is very high quality. 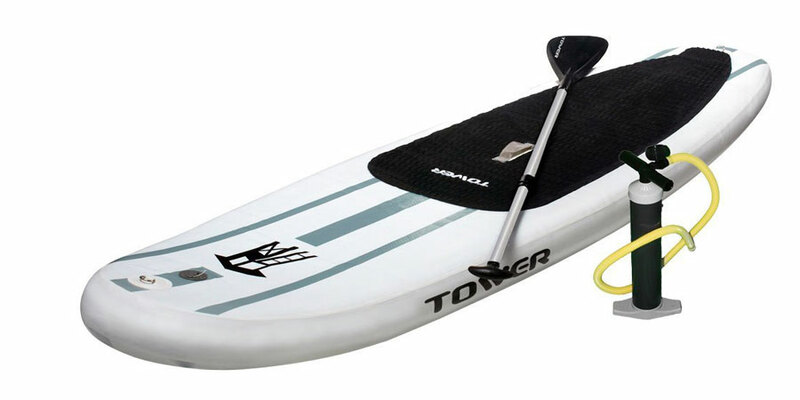 This paddle board is a total package and comes with a back pack and adjustable paddles. It is also very easy to carry around because of its light weight. It is also resistant to the harsh UV rays of the summer sun and this makes it to last long. It can accommodate heavy weight riders of up to 120 pounds. It comes in either color blue or pink. It also has an adjustable paddle that is made out of carbon. It has very smooth surface and the handles are well padded to offer great comfort to the rider. 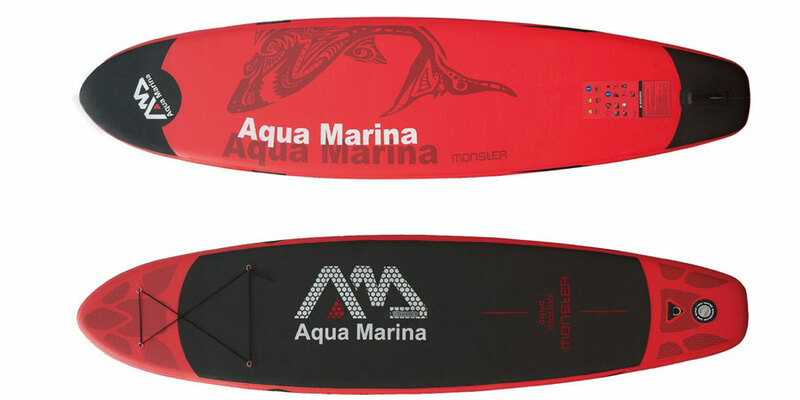 It is very wide in breadth and also stable which makes it very suitable for use in flat waters and also for surfing. This product comes with a warranty of 2 years during purchase. It is suitable for heavy weight riders and it has an included repair kit for any emergencies. It is also very durable as it is made with materials of rhea highest quality. It is very simple to store because of its light weight and a small size. Let your child have a fun with the family and friends by having a good time during water activities. Get your kid a board today and let them have the experience they will always remember. 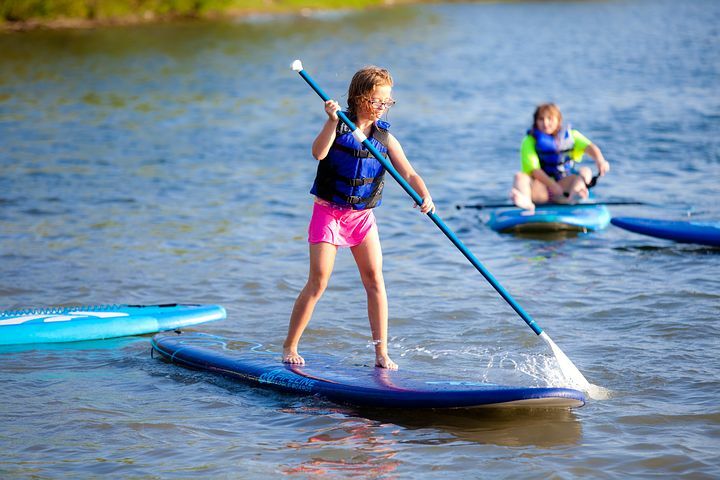 The standup paddle boards are a great value for your money and will make the summer season even more interesting as your child will always have fun indulging in the water activities with great safety. The wider the board the more stable it will be for you, this is great for kids, and also good if you are a beginner and just starting out. From a speed point of view wider boards are slower, so if speed is key then you want something that is narrow and long. As with the width of the length also varies, the longer the board the faster you tend to be able to go, if you are looking for a board with speed then go for something longer. Although longer board are faster they are more difficult to turn and require a bigger turning circle. If you are starting out then a 10 to 12-foot board is a great choice for you. This requires one to identify their interests and level of skills as the rider. This include major aspects of the paddler such as their weight, where and when to paddle and the main activities they indulge in as the paddler. There are very many designs available such as narrow and wide boards which are chosen according to the aggressiveness and needs of the user. The design and construction of the board. The paddler also has to put into consideration the design style, lengths and breadth of the paddle to buy and the material used according to their needs. For a high level paddler who engages in rigorous paddling, the material should be of the highest quality for durability and should also have a large length of dimensions. Check out our article Are Inflatable SUP Boards any Good? When purchasing a product, be sure that you get the best and the most durable. The factors listed above will be of great importance when getting yourself the best stand up paddle that will give you great service. Purchasing quality and expensive commodities always comes with a warranty. According to the manufacturer, the warranty can cover replacement in case of genuine breakages or replacement in case of defective commodities. 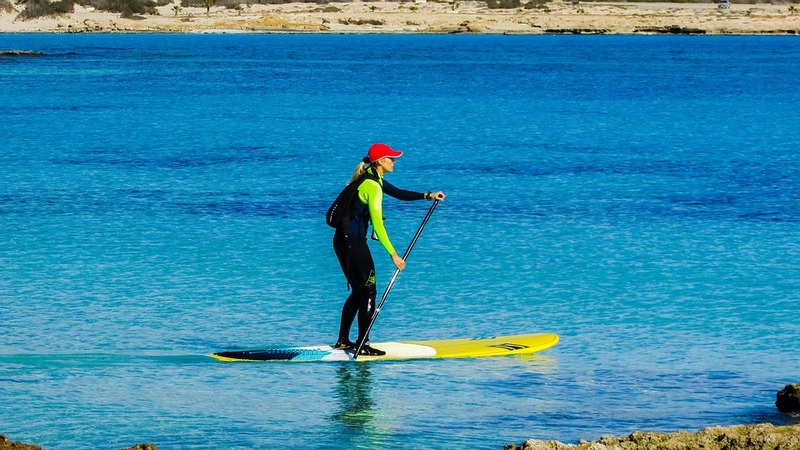 When buying a stand up paddle, the user should put in to consideration whether the product has a warranty, the length period of the warranty and what the warranty covers.